Two independent teams of scientists from the University of Utah and the University of Massachusetts Medical School have discovered that a gene crucial for learning, called Arc, can send its genetic material from one neuron to another by employing a strategy commonly used by viruses. The studies, "The Neuronal Gene Arc Encodes a Repurposed Retrotransposon Gag Protein that Mediates Intercellular RNA Transfer" published in Cell, and "Retrovirus-like Gag Protein Arc1 Binds RNA and Traffics across Synaptic Boutons" also in Cell, unveil a new way that nervous system cells interact. "This work is a great example of the importance of basic neuroscience research. What began as an effort to examine the behavior of a gene involved in memory and implicated in neurological disorders such as Alzheimer's disease has unexpectedly led to the discovery of an entirely new process, which neurons may use to send genetic information to one another." Edmund Talley, PhD, Program Director of Channels, Synapses and Circuits, National Institute of Neurological Disorders and Stroke (NINDS), National Institutes of Health. Arc is known to play a vital role in the brain's ability to store new information, but little is known about how it works. Previous studies showed similarities between the Arc protein and proteins found in certain viruses like HIV, but it not how these similarities influenced Arc behavior. University of Utah research began examining Arc by introducing it into bacteria. 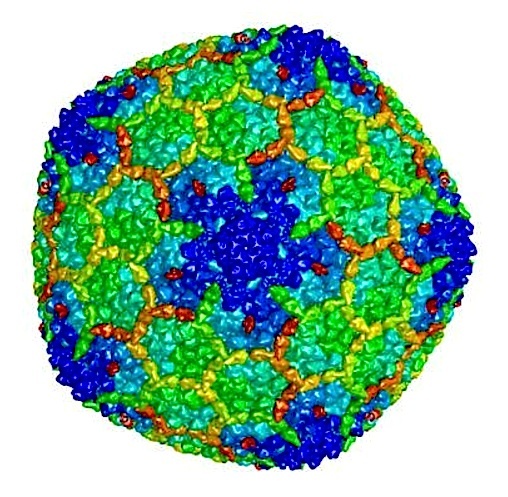 To their surprise, when the cells made the Arc protein, it clumped together into a form resembling a viral capsid, the shell that contains a virus' genetic information. The Arc "capsids" appeared to mirror viral capsids in their physical structure as well as their behavior. "Beforehand, if I had said to any neuroscientist that this gene sort of acts like a virus, they would have laughed at me," says Jason Shepherd PhD, and assistant professor at the University of Utah in Salt Lake City. "We knew this was going to take us in a completely new direction." Dr. Shepherd's team found that formerly Arc-less neurons that absorbed Arc filled vesicles and capsids of Arc mRNA — then began producing Arc protein. Just like neurons that naturally manufacture Arc protein, capsid eating neurons could also increase their own electrical activity. • flies without the Arc gene can't increase neural connections when motor neurons become more active, while normal flies can. Both UMass groups will continue investigating why cells use this virus-like strategy to shuttle Arc mRNA between cells and observe whether this system might also allow toxic proteins to spread through the brain, as with Alzheimer's. Dr. Budnik hopes more research will shed light on the development of all neurological diseases and lead to new therapies. Shepherd believes it may be possible to use Arc capsids to create gene therapies, just as viruses are currently used to introduce new gene instructions into other body cells. But, the human immune system sometimes attacks viruses, causing dangerous side effects in such therapies. Because Arc is native to the human body, it may be possible to use Arc capsids for delivery of genes without triggering an immune response. "This research highlights the fact that we often don't know where the cool discoveries are going to come from. We need to follow where the science takes us." Jason D. Shephard PhD, Department of Neurobiology and Anatomy, and the Department of Biochemistry, The University of Utah, Salt Lake City, Utah, USA. "Retrovirus-like Gag Protein Arc1 Binds RNA and Traffics across Synaptic Boutons"
Arc/Arg3.1 is required for synaptic plasticity and cognition, and mutations in this gene are linked to autism and schizophrenia. Arc bears a domain resembling retroviral/retrotransposon Gag-like proteins, which multimerize into a capsid that packages viral RNA. The significance of such a domain in a plasticity molecule is uncertain. Here, we report that the Drosophila Arc1 protein forms capsid-like structures that bind darc1 mRNA in neurons and is loaded into extracellular vesicles that are transferred from motorneurons to muscles. This loading and transfer depends on the darc1-mRNA 3? untranslated region, which contains retrotransposon-like sequences. Disrupting transfer blocks synaptic plasticity, suggesting that transfer of dArc1 complexed with its mRNA is required for this function. Notably, cultured cells also release extracellular vesicles containing the Gag region of the Copia retrotransposon complexed with its own mRNA. Taken together, our results point to a trans-synaptic mRNA transport mechanism involving retrovirus-like capsids and extracellular vesicles. "The Neuronal Gene Arc Encodes a Repurposed Retrotransposon Gag Protein that Mediates Intercellular RNA Transfer"
The neuronal gene Arc is essential for long-lasting information storage in the mammalian brain, mediates various forms of synaptic plasticity, and has been implicated in neurodevelopmental disorders. However, little is known about Arc’s molecular function and evolutionary origins. Here, we show that Arc self-assembles into virus-like capsids that encapsulate RNA. Endogenous Arc protein is released from neurons in extracellular vesicles that mediate the transfer of Arc mRNA into new target cells, where it can undergo activity-dependent translation. Purified Arc capsids are endocytosed and are able to transfer Arc mRNA into the cytoplasm of neurons. These results show that Arc exhibits similar molecular properties to retroviral Gag proteins. Evolutionary analysis indicates that Arc is derived from a vertebrate lineage of Ty3/gypsy retrotransposons, which are also ancestors to retroviruses. These findings suggest that Gag retroelements have been repurposed during evolution to mediate intercellular communication in the nervous system. Dr. Shepherd's work was supported by the NINDS (NS076364), the NIH's National Institute of Mental Health (MH112766), and the NIH's National Institute of General Medical Sciences (GM77582 and GM112972). Dr. Budnik's and Dr. Thomson's research was supported by the National Institute of Mental Health (MH070000). The National Institute of General Medical Sciences (NIGMS) supports basic research that increases our understanding of biological processes and lays the foundation for advances in disease diagnosis, treatment, and prevention. For more information, visit the NIGMS website.